Belgian Shepherd is one of the breeds very commonly used for herding sheep, competing in traditional style. If you compare Belgian’s working style with other shepherds, you soon realize it is very specific as well as the way of training a Belgian for herding. Many of good breeders try to assure a strong characters of their litters and thus search for working abilities in their parents. This way the idea of holding a herding trial for Belgian shepherds was born, as a possibility for fans of this breed to meet up, compare their experience and abilities and most of all gain a motivation for further training with their dogs. 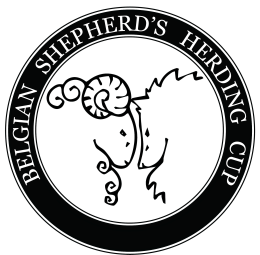 And because Belgian Shepherds are popular in herding all over the world this trial was decided to be international and to be named Belgian Shepherd’s Herding CUP (BSH CUP). In October 2015 the first BSH CUP was held in Czech Republic. It is an open international championship of Belgian Shepherds in sheep herding according to FCI IHT TS rules. From 2016 the CACITR title is awarded. During several years this trial has become an important event in every herding Belgian owner's diary and that it is an enjoyable time to spend with our friends loving this wonderful breed and with our darling dogs.